Kumbe Sportpesa Huwakamua Hii Design? So Sportpesa announced a deal to sponsor Hull City. We weren't told how much this deal is worth, only that it's a "multi-million pound" deal. Some (read Robert Alai) claim the deal is worth shs6 billion. I know, I know...Alai is not the most reliable source of information but just work with me here. Let's assume it's a "more reasonable" figure, relatively speaking, of shs2 billion. 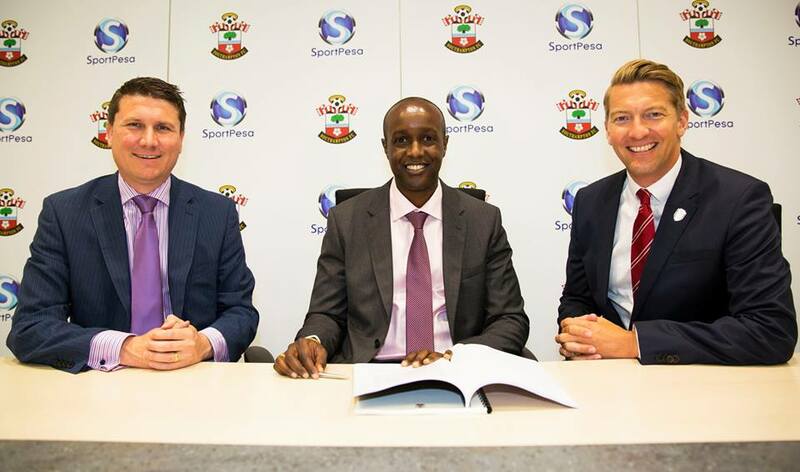 Haya, after the Hull City deal, these niggas show up at Southampton FC, where they're announced as Southampton's official betting partner, whatever the hell that means. Judging by how happy everyone in this photo is, the money was most likely paid upfront. Remember there's also the Arsenal training camp program. I think that was worth kedo 400 milli, I'm not sure. Locally, this company sponsors the Kenya Rugby Union (Sh 607 million), Kenyan Premier League (Sh 450 million), Gor Mahia (Sh 325 million) and AFC Leopards (Sh 225million). During the Chase Bank fiasco, this company was rumored to have shs500 million lying there. If at all this rumor was true, the fact that such a disruption never affected them whatsoever just shows how much money they play around with. I'm kinda surprised greedy safaricom hasn't started a betting side hustle. Remember Sportpesa started operations in 2014, so we're talking about a 2 year old company wielding this kind of financial muscle. Which brings me to the subject of this thread: kwaniiii, nyinyi hukamuliva hivi vyooooote na Sportpesa? Yaani it's those tiny shs100 bets that translate into those billions that are being thrown around? Don't get me wrong, I don't have a problem with Sportpesa. It's a free country, they're in business, they're not breaking any laws, and they're certainly not forcing anyone to place bets. There's no guarantee that if someone doesn't bet, they'll put that money to better use. I actually admire the way they've executed their business plan. I'm sure the owners never dreamed they'd be this successful. Plus allowing people to "bet as little as 100 shillings"? Genius move. It just proves that if you want to succeed in business, you can't afford to ignore the "kadogo economy". I guess what I'm trying to ask, in so many words, is: can we really claim to be facing economic hardships when we're willingly handing over billions of shillings to a betting company? When you hear people say gambling is addictive it means they are making a killing. Does not necessarily mean people have money. The ones we read in the news are true testament that hiyo pesa has to come from somewhere. Loan or school fee. Some might argue that even alcohol and cigarettes are addictive, so the person who takes two for the road or smokes a pack a day is no different from the one who places shs200 bets daily. One might then conclude that these people at least have some disposable income that they "waste" on alcohol/cigarettes/betting. 2m in users. 1M daily site users during EPL. They'd be at Kes. 300M in revenue per month. Kuna uwezekano laundering inafanywa mahali but may be my observations are far-fetched. Sportpesa makes 400 Million before tax every month. Even if they were to make 12B a year, It is impossible to to sponsor KPL, Gor, FC, Leopards, Hull city, Kenya Rugby team and still be the official betting partners for Arsenal and Southampton. There is also the Pambazuka lottery. Massive money laundering being done by the Bulgarian mafia. The whole thing still does not make sense to me..
Its the closest thing that will make sense to them. The money laundering part however makes lots of sense. That money laundering angle is an interesting one, given the shady nature of the Bulgarian dudes. Suppose one had dirty money that they wanted to clean, and one also owned a betting site. Isn't it possible for one to program thousands of bots to place losing bets (that will translate into income for the company)? I doubt the Betting Control and Licensing Board has the technical know how to monitor these digital gambling platforms. But then again I'd like to imagine British regulators conduct due diligence on companies before allowing them to seal deals of the kind sportpesa has with Arsenal, Hull City and Southampton. Na sportpesa wanasema bado...in the next two years they expect to be operational in 4 continents, so I expect them to strike more deals in Europe, Asia, Africa and maybe even south America. Meaning more billions are going to be spent. What I admire about these Bulgarians is that they've managed to convince kenyans that this is a kenyan company. I'm sure that Kenyan CEO receives instructions from these Bulgarians. Pretty much the same way Safaricom, a supposedly Kenyan company, receives instructions from Vodafone. @Okiya when are they going public? I guess what I'm trying to ask, in so many words, is: can we really claim to be facing economic hardships when we're willingly handing over billions of shillings to a UK based football club as sponsorship?